A LESSON IN HOW sustainability CAN underpin corporate purpose, accelerate transformation and DRIVE A SHIFT IN saleS. Kingfisher is Europe's biggest home improvement company with over 1,200 stores in 10 countries across Europe with brands that include B&Q, Screwfix, Castorama and Koçtas. In early 2017, fuelled by the “ONE Kingfisher” transformation programme and a corporate wide purpose that “everyone should have a home they feel good about”, Kingfisher turned to Fortitude. Our task was to devise a customer-first sustainability strategy to underpin the corporate purpose, accelerate transformation and shift the company so that, by 2020, 50% of sales will come from products that help create more sustainable homes. With over six million customers a week, the opportunity to make a positive impact on how people live is immense. Using customer research in five countries, including video ethnographies in over 50 homes, we were able to understand what ‘sustainability’ really meant to customers - looking at the concerns and desires of customers to create a home they feel good about. One early insight was that customers care about living sustainably but they just don’t call it sustainability. Saving energy is top of mind, reconnecting to nature through indoor and outdoor space is a massive need and people are increasingly concerned about living in toxin-free homes. Based on these insights, we recommended to that the company took a bold step and re-framed the strategy to focus on the reality of their customers’ lives. This approach was significantly different from the more traditional sustainability strategies that are shaped primarily around an organisation’s own operations. Deliver best practice to reduce cost and risk. Kick-start new ways of working to spark innovation and drive growth. Build trust, attract talent and enhance our corporate reputation. Our approach was to create a strategy that would connect to customers and colleagues and drive innovation in products and services. While customers were front and centre in the strategy development, it was critical that Kingfisher’s own operations were world-class in terms of sustainability. Fortunately that was already the case: the strategy could build upon the hugely respected ‘Net Positive’ plan begun in 2012. This set out a plan to deliver a restorative impact to the environment. So the foundations were already in place. However, we helped simplify and focus the strategy, moving from 53 to 12 goals, while still stretching the ambition to further reduce the company’s carbon footprint, embed circular economy principles, eliminate waste and support colleagues to make sustainability part of their everyday work. To ensure robust best practice, we also advised on the formation and terms of reference for a new Advisory Committee which is now chaired by Dame Polly Courtice, Director of the University of Cambridge Institute for Sustainability Leadership. Save money by saving energy and water. Each goal was linked to precise and ambitious targets - for example to enable a 50% reduction in customer energy use through the company’s products, services and advice. It’s easy to see how framing targets as customer benefits could spark a new retail proposition and form the starting point for service innovation. 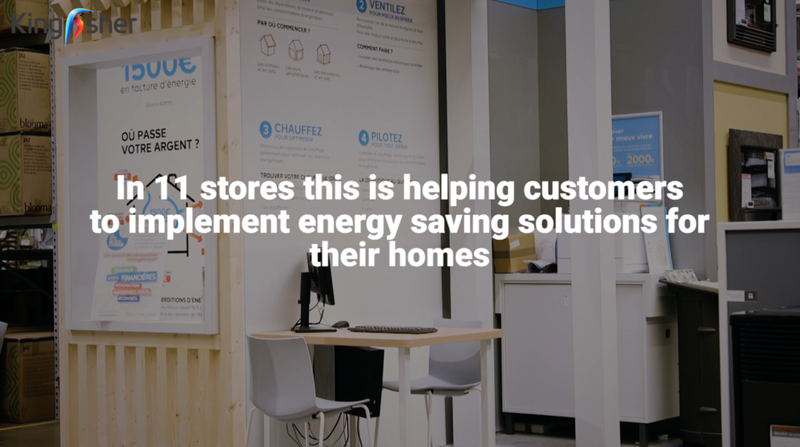 This approach links the sustainability ambition directly to customer. Customers are the locus of any retailer and we knew that, if we could make that connection, we’d have a strategy that moved beyond simply enhancing corporate reputation into customer offers, products, services and ultimately growth. Once the high level plan was agreed by the Group Executive Committee in mid-2017, it was then stress-tested widely with internal and external experts and socialised so that it could be operationalised. It’s not hard to imagine how readily the Big Goals and targets would connect with functions in a customer-obsessed retailer. That was our intent. By framing the goals and targets in customer language, we closed the gap between sustainability and ‘real business’. This made it easy to engage teams in product innovation, range editing, digital transformation and product marketing. With our client counterparts, we co-developed dozens of ‘customer problem statements’ based around the Big Goals that were taken into the development pipeline by agile innovation teams. We created content and structures for eLearning modules and have helped engage the product communications, brand strategy and sourcing teams to ensure the strategy is delivered right across the company. We ran co-creation workshops with operating companies from five countries to generate ideas for that would work in store for each country and find ways to make use of existing communication and transformation initiatives to avoid duplication of effort. We mapped out trading calendars across all the major in-country retail brands to identify opportunities to influence customer marketing or product ranges - for example campaigns around gardens, water, smart home and bathrooms. Alongside all of this, we developed a communications and engagement strategy and activation for employees and opinion formers. Fortitude designed and created a wide range of communication assets using language, visuals and channels not normally seen in sustainability. Ths included management briefing packs, ‘plan on a page’, external stakeholder report, a series of short films, animated GIFs, an eLearning module and an asset library and guidelines to embed the strategy across the organisation. As part of the communications strategy, we devised a ‘grassroots’ engagement approach to co-create the plan and materials with store-based employees. The sustainable growth plan was successfully launched to external opinion formers, sustainability experts and colleagues in January 2018. Teams from across the organisation are now working to implement the sustainable growth plan. It’s being used to define ‘customer problem statements’ for innovation teams. Store teams are being engaged. Product ranges are being reshaped. And the organisation is now equipped with a roadmap as it continues its radical transformation. “With this strategy, we are taking the next steps towards becoming a truly sustainable company”. “Kingfisher may well be one of the first major brands to enable the millions of customers buying its products and services to truly live a sustainable lifestyle by connecting its sustainability programme with the issues we all care about”.